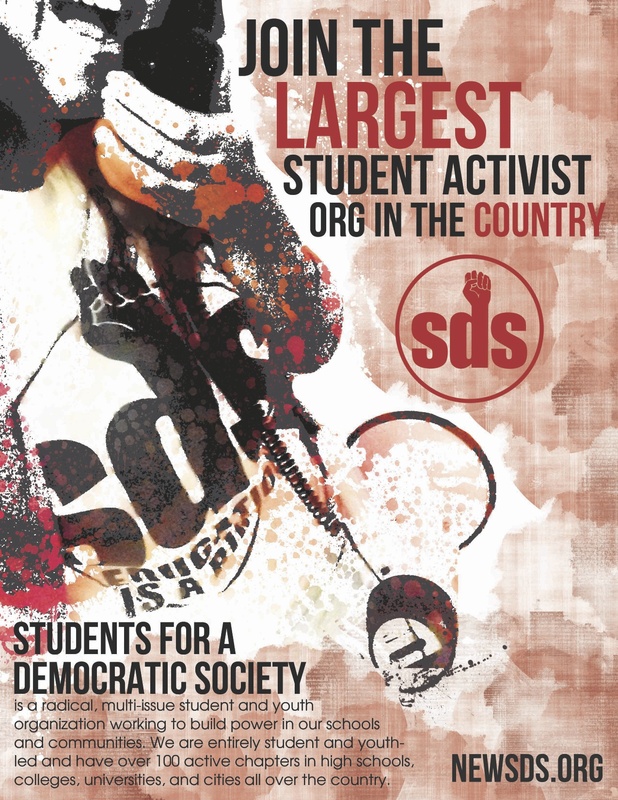 5th Annual SDS National Convention! The 3rd National Call In Day to stop FBI repression and stand in solidarity with anti-war activists targeted by the September 24 FBI raids and Grand Jury subpoenas is this Tuesday, October 19. This is the third group of activists scheduled to appear at the Grand Jury. All of the activists are refusing to testify, so the Assistant U.S. Attorney Brand Fox has withdrawn the subpoenas thus far. The Grand Jury continues however, and arrests, or subpoenas offering immunity—forcing activists to talk under the threat of imprisonment–are possibilities. We need your support. Please circulate this national call widely. **End repression of anti-war and international solidarity activists! **Return all materials seized in the raid! **Call off the Grand Jury! On September 24, the FBI raided two Chicago and five Minneapolis homes of well-known anti-war and international solidarity activists. 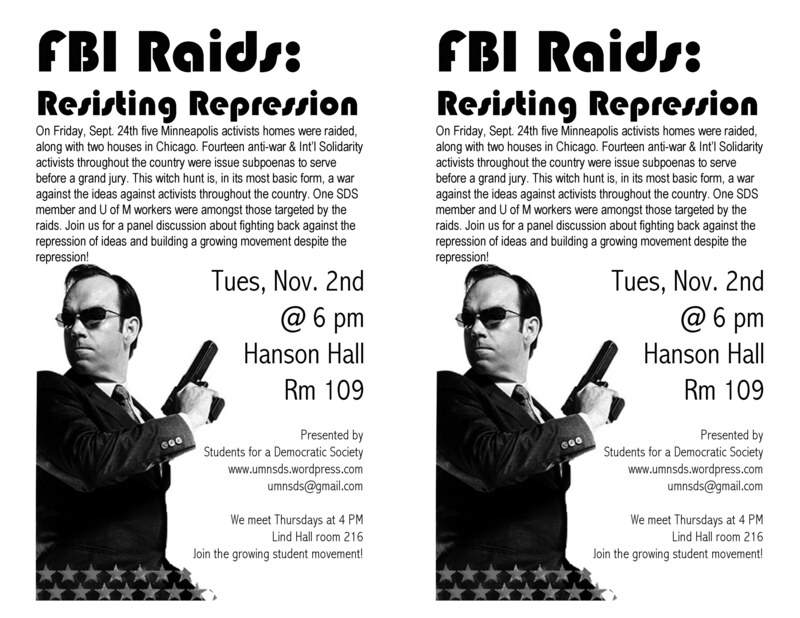 Also raided were the offices of the Minneapolis-Saint Paul based Anti-War Committee. Subpoenas to answer questions at a Grand Jury in Chicago were delivered to other activists at their homes and work places. In the past week, the FBI continues to attempt to harass other anti-war activists at their homes and work. When dozens of FBI agents stormed in, they took computer hard drives, cell phones, documents, newspapers and children’s artwork. They took 28 boxes out of one Chicago home, including a framed photo of the Reverend Doctor Martin Luther King Jr. shaking hands with Malcolm X. The FBI subpoenaed 14 activists in Illinois, Minnesota and Michigan to testify at the Grand Jury. According to the FBI, the goal of the raids was to show material support for terrorism charges. It is outrageous! All the activists publicly announced they are refusing to testify and want the Grand Jury called off. The Assistant U.S. Attorney Brandon Fox withdrew the subpoenas at this point, but it is not over. The government may force people to testify under threat of imprisonment or make arrests. The U.S. government is trying to put people in jail for anti-war and international solidarity activism. These people have done nothing wrong. They have given money to no one. Their freedom is at stake. Those targeted are well-known leaders in the anti-war movement and many helped to organize the huge protest against the Republican National Convention in St. Paul, MN in September 2008. This is the suppression of our democratic rights. It threatens our families, our children and our communities. This is a U.S. government attempt to silence those who support resistance to oppression in the Middle East and Latin America, by putting people in jail. The targeted activists are refusing to be pulled into conversations with the FBI about their political views or their organizing against war and occupation. The activists are involved with many groups, including the Palestine Solidarity Group, Students for a Democratic Society, Twin-Cities Anti-War Committee, Colombia Action Network, the Freedom Road Socialist Organization and Fight Back! newspaper. Thousands have come together in response to the FBI raids on seven homes and an anti-war office on Friday, September 24, 2010. Across the country organizations and individuals are standing together to protest the United States government’s attempt to silence and criminalize anti-war and international solidarity activists. Protests against the intimidation and harassment have taken place or are planned for 39 cities across the country. From Minneapolis and Chicago, to Los Angeles, Atlanta, Kalamazoo, MI and Dallas, Texas. The response has been tremendous an continues to grow. We are calling for further actions to take place in the coming week as the first Grand Jury Subpoenas call for activists to appear on October 5. **Stop the Grand Jury Subpoenas of activists! Take action at local federal buildings and FBI offices! Organize demonstrations in your community! Funds for legal defense will be needed. We will announce where they can be sent in the next few days. Reach out to your organization or community group and send a statement of solidarity. ***Please print and distribute at Oct 2 March in DC and in your community today!